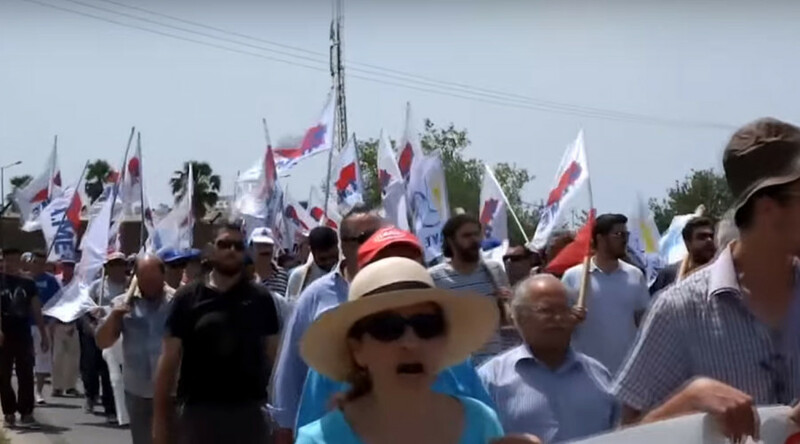 Greek left wing protesters have held a major rally outside the NATO base in Souda Bay on the Greek island of Crete, demanding the expulsion of the “imperialist” alliance which they claim “violates” the “sovereignty” of the country. Amid heavy police presence, the protesters, led by Greek MP and Communist Party member Manolis Syntychakis, burned EU and NATO flags in front of the cameras. Holding protest banners and chanting anti- NATO slogans, the crowd delivered a letter bearing a list of demands to Air Force Colonel Ioannis Gerolimos, commander of the Hellenic Air Force base. “We are here and we call upon citizens to fight and close the foreign bases and disengage our country from any form of US and NATO [participation],” said the chairman of the All Workers Military Front (PAME), Joanna Kourpa. The Hellenic Air Force Base, home to Greek Air Force’s 115th Combat Wing, located east of the city of Hania, is also used by the United States Naval Support Activity (NSA). In addition it houses NATO Missile Firing Installation. In February, a seven-ship flotilla was ordered to the Aegean to carry out reconnaissance patrols to help the coastguard of Greece and Turkey stem out the immigrant flow. The protesters who are led by PAME view the Aegean operation as “mortal danger” which “violates sovereignty” of Greece. They accuse Athens and the EU of using the European refugee crisis as a “pretext” to promote “imperialist” ambitions and start interventions in countries such as Syria and Libya.